Merry Holidays! How Do Twitter Users Celebrate the Season? Are people not saying “Merry Christmas” anymore? Have we all become politically correct around the holidays? Sarah Pulliam Bailey reached out to me to get some insight on how “Merry Christmas” is used on the internet and so I turned to Twitter to find out (some of these results showed up in a piece in the Washington Post). Using the terrific rtweet package for R, I scraped tweets containing both “Merry Christmas” and “Happy Holidays” in the week before Christmas (December 20-21, to be specific). The graph below shows the frequency of those terms over the two days I collected. There needs to be some explanation of how Twitter’s public API works, however. Most Twitter searches are severely limited. For example, using the public PUSH API that is free, a user is limited to a search that returns 18000 results. That search query can only be executed every fifteen minutes. The API will look back a maximum of 8-9 days to find tweets containing the matching terms, but if the 18000 maximum is reached in less time than that, the query is terminated. So in the graph below I can only show three total hours across two days in which my scrape caught the entire volume of both terms in the same hour. If you want to see the full time frame here’s a graph of that. At the peak, “Merry Christmas” was tweeted out between 6,000 and 8,000 times per hour. 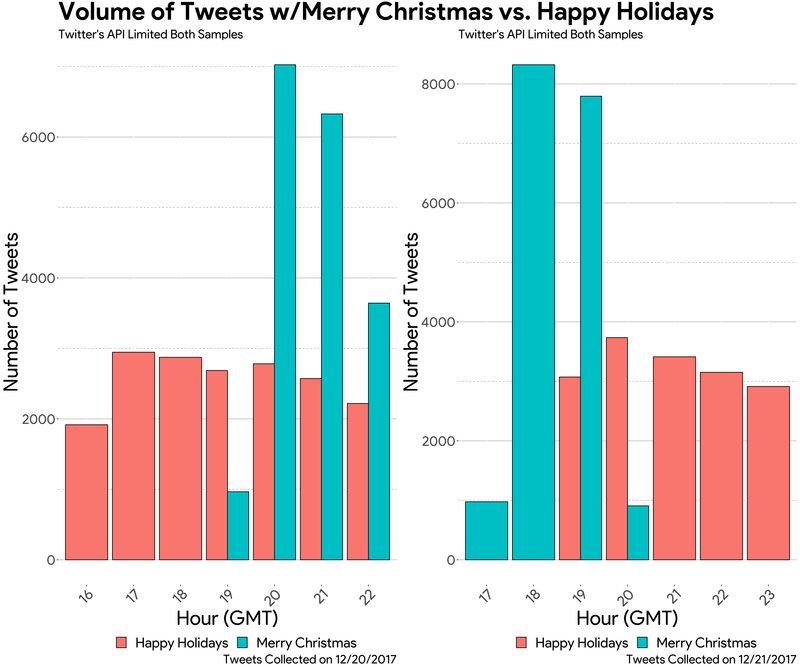 “Happy Holidays” appeared consistently in around 3,000 tweets per hour. It’s clear: people don’t use “Happy Holidays” as much. Given Trump’s militarization of Christmas, we would expect a defiant tone of those saying Merry Christmas in their public invocations. So, what is the sentiment of those tweets? Are “Merry Christmas” tweeters feeling more festive than those who resort to “Happy Holidays?” Using the bing lexicon, which codes thousands of words as either positive or negative, I did a total sentiment score for both phrases on December 20th and 21st, the results are displayed below. I coded total sentiment as all the positive words – negative words. The results are clear and consistent here. Both phrases are tweeted with a very positive attitude. It’s shocking how close the sentiment is between the two really. For instance, on 12/20 for every 100 positive words contained in “Happy Holidays” tweets, there were 97 positive words in “Merry Christmas” tweets. On 12/21 the ratio was 100 to 100. People are not saying “Happy Holidays” or “Merry Christmas” with any angry intent, at least on Twitter. But, are there some more subtle messages to be found in these tweets? I did a word count and scanned for words that could be considered overtly political or religious in tweets containing either phrase. The results are displayed in the graph below. It’s clear that “Merry Christmas” tweets are much more likely to contain political or religious words. “America” showed up ten times more in “Merry Christmas” tweets, for example, and “God” was five times more frequent. There were Trump-centric words as well. 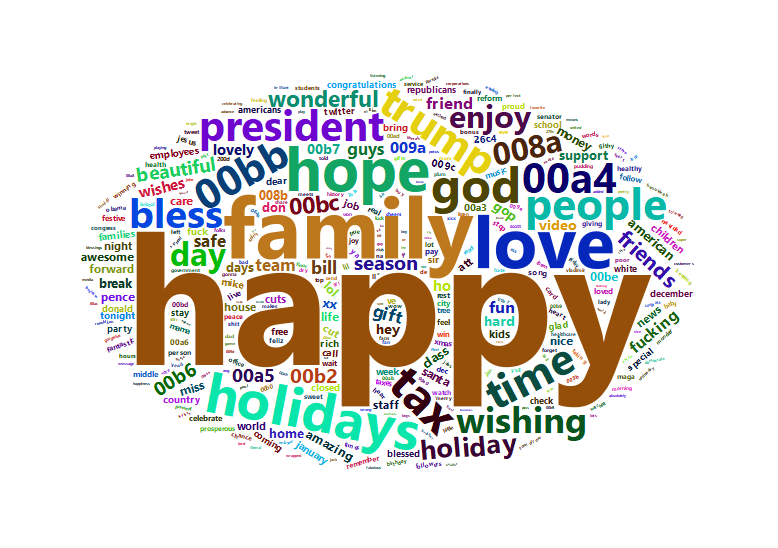 Nearly 2% of “Merry Christmas” tweets contained the President’s name and his famous hashtag “MAGA” was much more prevalent among “Merry Christmas” tweets. It’s always important to note that natural language processing is in its infancy. Algorithms are getting better and better but it’s incredibly hard to pick up nuance, satire, and sarcasm in the written word (even for humans, sometimes). It’s very likely that some of these tweets were written in jest. That said, you can take a deeper dive yourself. You can look through the list of “Merry Christmas” tweets here and here, and “Happy Holidays” tweets here and here, yourself. 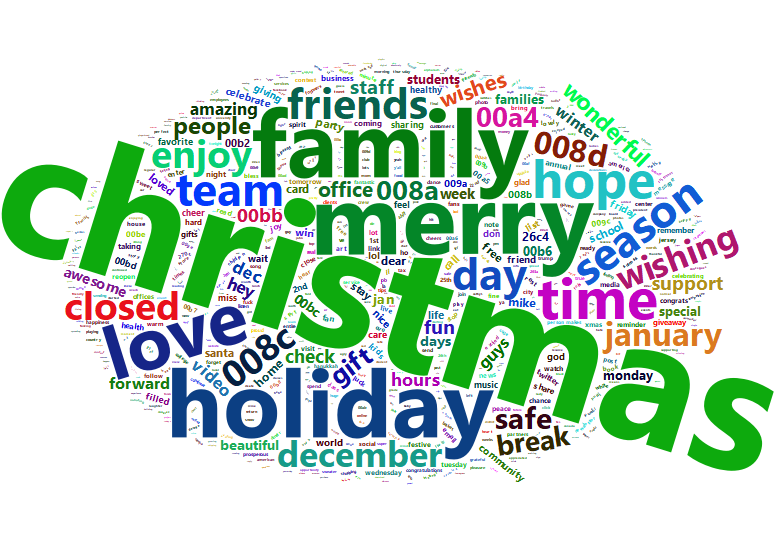 also made a “Merry Christmas” wordcloud along with a “Happy Holidays” wordcloud. It would be really nice to compare the usage of these two phrases on Twitter this Christmas and then in December of 2015 before Donald Trump put such an intense spotlight on the phrase to see how things have changed. Alas, to acquire tweets from that time frame would cost thousands of dollars. However, as more researchers begin to collect their own personal Twitter datasets, research like this could take off, leading to a whole new wave of scholarship in the social sciences. When we have to consider the party affiliation of our friends who will be attending an anniversary dinner or a Christmas party, we have entered a very dark place in American politics.